Well that's all for episode one. Thanks for making it this far with us. We will pick up with episode 2 after a short break. There will be some changes. Firstly, Auggie(My co-artist) will be taking the art lead for the next episode. Some of you are already familiar with his work from our gag strips. This had been primarily a learning experience for us and the comic may undergo some experimenting in the future. But the story will go on and we're especially excited for the events of episode 2. We will be back in june with at least the first 4 pages of ep.2. The mysterious fragment Auggie and Low aquired will lead them on an all new adventure to uncover its secrets. Along the way they will aquire two new companions, dangeorus enemies, and if they're lucky, some treasure along the way. Thanks for checking us out. See you soon! Sounds exciting. Can't wait for June. Thanks! We can't either. But we want to get off to a good start and have a few buffers prepared so we'll be taking the time to do that. Sweet as. I'm excited for episode 2 and to see more of Auggie's work. Happy drawing! I hope I won't disappoint you guys. As always thanks for reading. Great first episode! I sincerely look forward to the next one. Keep up the fantastic work. Thanks very much! We greatly appreciate it. Lmao! Yeah he was gonna go with Pouch Quickly but he decided against that. Good stuff! Enjoy your break. Thank you. The absence of a deadline will be nice for a bit. But we'll be working on trying to start of strong with a few buffers as well. Nice way to close an episode! Have a nice break! See you in June! I had a tough time with this page. I wasn't sure if it was enough for an ending or not. But I felt this did the job. I'm glad you thought it was nice enough. More bad news for our dynamic duo. Mr. Clean as it in for Low and seems eager to put the screws to him. I am just loving this so far! The characters are great and the fight scenes are the best I've seen in the webcomic world. Keep up the good work and I look forward to the next round. 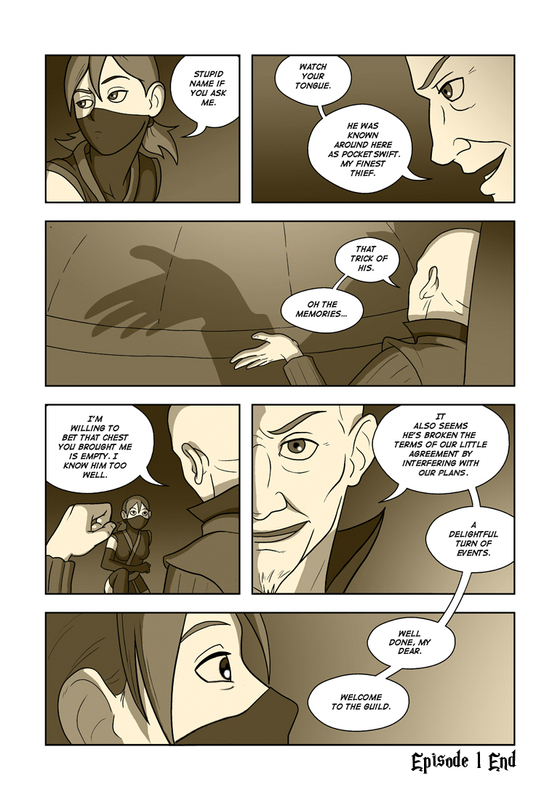 And I have a question - is it manga studio that allows you to make those more organic-looking dialogue bubbles? Cuz the one thing I hate about doing my dialogue in Photoshop is that the bubbles are basically so round and computery, but I'm not quite sure I want to draw them all by hand either. Manga Studio has a whole array of pre-cut word balloons. You could hand draw them too but Low and I are trying to go for a consistent look. It would be tough if all the balloons had a different shape. Also these pre-cut balloons are easily resized so your text always fits perfectly. Ah, that makes sense! It has a good effect. Thanks! Great story. This has become one of my fave webcomics here. Keep up the excellent work. We will be doing our best. Really nice to hear that you enjoyed it. I am curious if she is good are evil. If I had to guess I would say that she is on the side of good, but I have been known to be wrong. Note: I like the shadow in the third frame. :o I just read this all now. I liked it. Luckily June isn't too far away because I want more. We're happy to hear that and thanks for checking us out. We're doing our best to get a good start on episode 2.